We love the book - My Heart Is Like a Zoo. We had made bear and lion Valentine swap cards from the book. 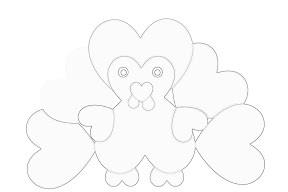 When I saw the heart Wooden turkey craft at classified mom, I got the idea of creating a thankful heart turkey. Starting this year, we are planning to ceate a thankful/Gratitude turkey every year, so that CJ can write what she is thankful for. 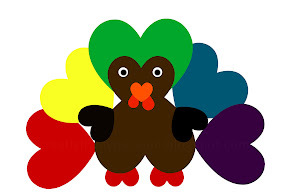 We played around Picnik software to create different heart templates of the Turkey. Using the different hearts template, we cut the heart shapes out of construction paper. Head/face, wattle, beak, Wiggly eyes in the order. 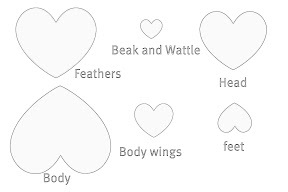 For the wattles, we cut a heart shape into half. Then she glued in the Wings and the feet. I asked CJ what she is thankful for and with the spelling help she wrote them in the turkey feathers! In one of the hearts she wrote "me" and Says "Thank you God for making me, me". She likes the Butterfly song(If I were the Butterfly) and the lyrics! Totally amazed how she linked the song lyrics with the thankfulness! Ooh I love that book it is soooo cute! We have given it as a gift before. Definitely full of love. 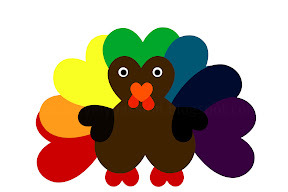 And ADORABLE to do a heart turkey! Thank you for joining Kids Get Crafty! This is adorable! What a great idea. Esther! I think this project is fantastically adorable! Thank you so much for linking up to Show and Tell this week. I have a lot of different size heart punches and I can't wait to give this a try for next year. so cute and I love that she wrote what she is thankful for on the hearts. Saving this idea for next year! LOVE the use of hearts - my girls would enjoy that. Thanks for linking your idea to the Sunday Showcase last week. Hope to see you this week! That is so cute! I think we will have to do that in our home this year! Thank you Marla! The kids will love it! SUPER cute!! Love the hearts and gratitude aspect of it! Thanks for sharing on The Sunday Showcase, I'll be featuring this tomorrow!